Carl Zeiss introduces a new generation of pocket binoculars, the Victory Compact 8x20 B T* and 10x25 B T* models, representing a peak in the evolution of this type of binoculars. With a functional and attractive design, the matte, black rubber armoring ensures that the binoculars can be held comfortably even in wet and cold weather. They are guaranteed waterproof, and they are also dust-proof. Zeiss T* multilayer coating of all lens elements and prisms of the optical system guarantees high brilliance, razor-sharp definition and outstanding color fidelity. High-eyepoint eyepieces with lockable push-pull eyecups also allow eyeglass wearers to enjoy the full field of view. A casing made of very sturdy, glass fiber reinforced synthetic material adds the benefit of low weight. Dirt, grease and water repelling pearl-off effect. Simplified, streak-free and gentle cleaning. 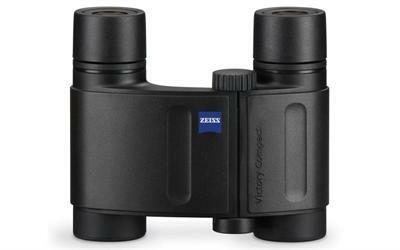 Click the button below to add the Zeiss Victory 10x25 T* Compact Binoculars to your wish list.